Nowhere else have I seen the medieval merge into the modern urban so seamlessly as in the lush country of Estonia. Espar and his wife are about our age. The empty nesters decided a couple of years ago that the pace of city life is no longer their cup of tea and they moved to Koppelmaa, 15 minutes away from the city of Tallinn. They drive back once a week if Fomo strikes, knowing that tranquillity is literally in their backyard. Espar built a tree house in Koppelmaa, which is where we spend the night, in between our drive from Riga in Latvia to Tallinn in Estonia. 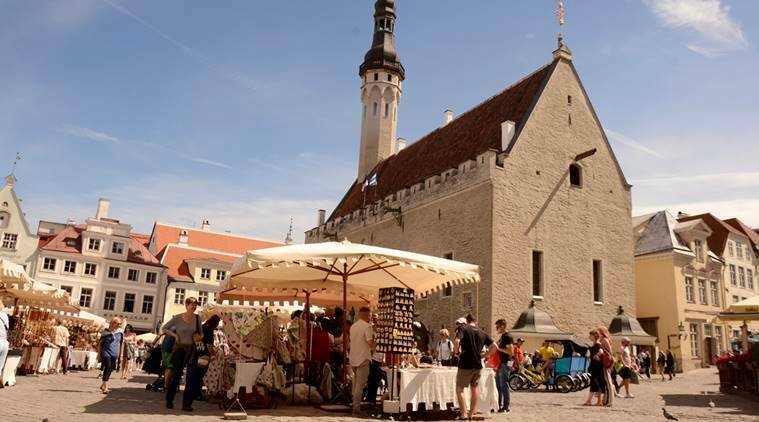 Tallinn is famous for its beautiful medieval Old Town (now a Unesco World Heritage site). Despite passing through the hands of the Germans, Danes, Swedes and Russians before Estonia finally gained independence, the Old Town retains the wholly preserved medieval structures back from the 13th century, replete with empty-faced black metal statues strongly reminiscent of the Dementors. If not the lovely architecture, the souvenir shops are guaranteed to take you back in time. They stock everything from decorative witches of the 13th century to Viking helmets to Russian Matryoshka dolls to Baltic amber jewellery. Wandering around the cobbled lanes, gazing down from the viewing platforms and souvenir shopping is a great way to spend half a day. But it’s not just the Old Town that makes you feel like a part of history. We stayed near the Viru Gates of the Wall of Tallinn. While there is your usual umbilical cord for American tourists (McDonald’s), there are enough local coffee shops and restaurants nestled among the cobbled stones. There are open stalls selling nuts, with vendors dressed in 13th century costumes! There is a Museum of Medieval Torture Instruments around the corner, rubbing shoulders with a KGB prison cell. Don’t let the churches and spires fool you, though. The millennials of Tallinn are on trend. A city that has less than half the population of Gurugram was host to multiple concerts and exhibitions in 2018 and will be hosting ageing pop-star Bryan Adams in 2019. Kalamaja, a former suburb for the working classes, is now the hipster area where old warehouses house designer shops, gigs, IT crowds and start-ups alike (the city has more start-ups per person than anywhere else in Europe). Come evening, we realise why Tallinn is also one of the best party places. Helsinki delivers hordes of tourists here for the cheaper alcohol. The Telliskivi area is the night-time hotspot with live gigs and the Von Krahli Baar, which is theatre by day and pub by night. With little children in tow, we settle for a chat with the Viru Backpackers staff instead. The hostel boasts an AK47 shooting tour, but we really didn’t even want to find out what it was about. The next day is spent more like a local. 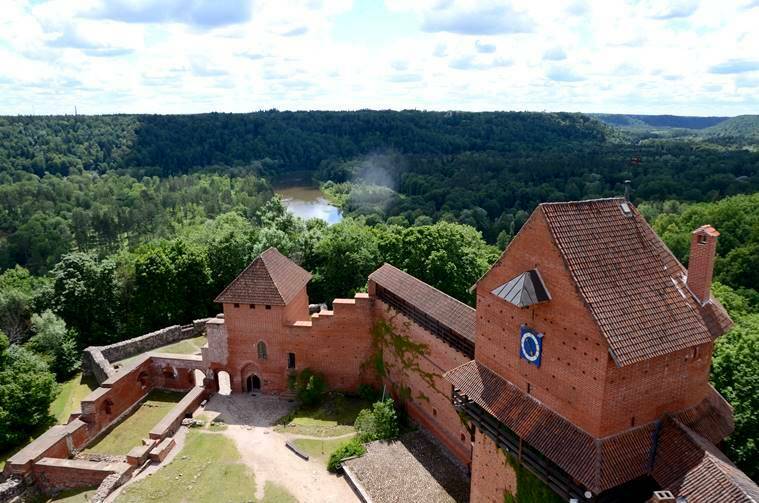 We explore sections of The Wall, climb up the old winding stairs and take photos of the red bricks and stones contrasting with the lush green stretches beyond. The children enjoy a game of hide and seek, while we picnic in the gardens with a bottle of wine. Later, while the husband heads to return to return the rental car, the children and I stroll in the central square looking for bargains in the Sarojini-like open-market stalls. It was high summer, and despite being the fourth distant city from the North Pole, we enjoyed the summer squares bustling with life and blooming flower shops. I’m keen on picking some local literature for young readers when I travel and before we move on, we head to Rahva Raamat (People’s Book). It was chosen as one of the best bookstores by the London Book Fair 2016, and offers a wide variety for all ages, just not in English. We pick up Snupsi, a book about an alien and the only children’s book in English, and settle down in one of the inviting chairs for a while. On Espar’s recommendation, we dine at Klaus, a small and lovely café-restaurant. Espar himself lives on a diet of fresh strawberries picked from the jungle, fish straight out of the Keila River nearby and freshly laid eggs. We spend the better part of the evening playing football, catching pet frogs and running up and down to the tree house. As we swap life stories between empty nesters and travelers with little children and invite our hosts to come over to Delhi someday, we realise, living between the beauty of Old Town, the trend of Kalamaja and the freshness of Koppelmaa forest, these urban dwellers of Tallinn have it all.